While it is not yet complete, I wanted to share a screenshot of the tower I built in Minecraft. Yes, that's lava cascading down. There's a lava fountain inside. The interior still needs a lot of work though. Couldn't build the tower any taller, I hit the maximum build height. That's what I get for building it on the top of a mountain. whoa... how many hours do you have invested in this? @ Monique: Enough. I think getting the lava to do what I wanted took longer than building the whole rest of the tower. I only had 1 accident where I flooded a floor with lava. 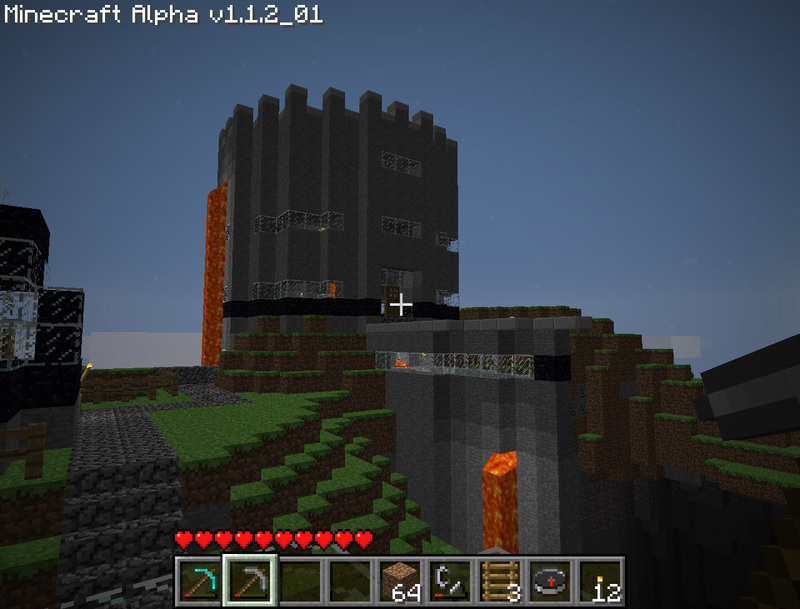 It took roughly 2 hours last night to mine the obsidian for that one dark ring around the tower. I like to think that the reason I don't play computer games is that I'm not interested in them. But there's a bit of me that's worried I'd get addicted and spend all my time doing it. You could always dig the mountain away from the tower's base to make it look taller. @ Linda: I think it's evident I'm susceptible to being addicted to games. @ Vid: I could. But I like it how it is. The back left side looks taller because there is a cliff back there and the tower continues down the face of the cliff.